Oy vay! Is this pregnancy over yet? People had told me the last 10 weeks would be the slowest and they weren't kidding. Although, really, I'm not sure if it seems like it's going all that much slower. All I know is that I'm definitely feeling WAY more pregnant!!! Another fun thing has been the cramps in my calves. I've had two or three in the past two weeks and they are SOOOOO not fun! Now I understand why professional athletes writhe around in pain on the field for "just a cramp." I literally moan out loud they hurt so bad. And they linger too for a few days, which is odd. It makes shaving my legs in the shower a real doosy of a chore. If it were just a smidge colder, I wouldn't even bother trying! My poor feet are neglected too, since I've been hesitant to spend money on a pedicure. But Puff has an unhealthy fear of feet, so he wouldn't touch them if his life depended on it! In important doctor news, I went in last week at 33 1/2 weeks and they mentioned again that Bimmer seems BIG. When they feel around for her, there's not much fluid in there... mostly baby. So, we go back April 25th to feel and measure again and will most likely do an ultrasound to get a better idea of her size. If she's pushing 8 pounds (or more) as they suspect she might be (really?!? already?!?) then we will have to make a decision about inducing so we could avoid an emergency c-section later. On the bright side? She's head down, right in position! 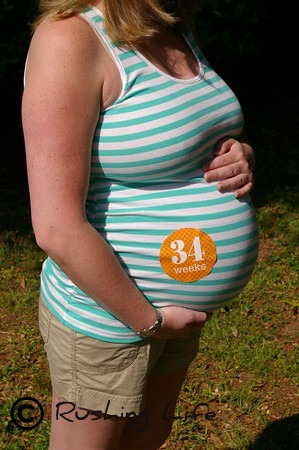 The last trimester is harder than anyone ever tells you. Everything hurts! Sleeping is a joke! Those little baby nudges feel like they could break a rib now! But hang in there! The marathon is almost over!! !